'Pazham Pori' is a traditional recipe, served in the southern Indian state of Kerala. It is consumed as evening time snack and is made out of a special type of banana called “nendran pazham” cultivated only in Kerala and southern parts of Tamil Nadu. This recipe is a twist on the traditional pazham pori with oats. By adding Oats in this recipe transformed into a tasty, more crispy and more healthy snack. Prepare the batter by combining maida, corn flour, turmeric, salt, sugar and little water for vegetarians(or eggs). Using a whisk or spoon mix thoroughly without forming any lumps. Dip the banana strips in the batter then roll into the oats and deep fry in hot oil till cooked on inside and crisp on outside. You could bake this banana fritters or even air fry them too. Note: For crispier pazham poris add a pinch of baking powder in that batter. You could add half beaten eggs for more taste. Here i have prepared pure vegetarian version. yummy.. i had tasted it some where once. but i think it was nt coated with oats. 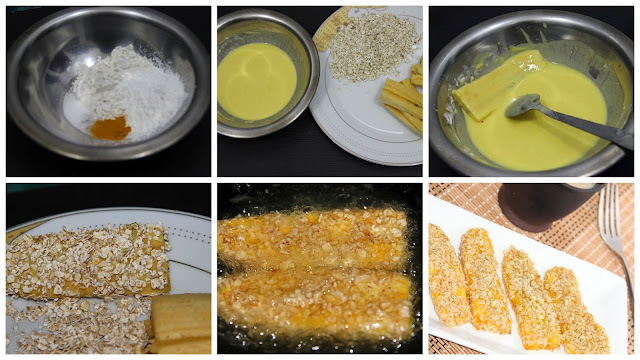 Delicious oats coated banana fritters, loved the idea and perfectly made.